Mykolaiv Oblast borders Odessa, Kirovohrad, Kherson and Dnipropetrovsk oblasts. The southern part of Mykolaiv oblasts has an access to the Black Sea. Along the coast there are several ports and the Mykolaiv International Airport. 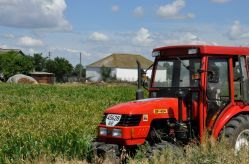 The agriculture is the leading industry of the Mykolaiv regional economy. The oblast produces almost seven percent of cereals and sunflower, three percent of gross milk production. Mykolayiv is the large center of shipbuilding of Ukraine, where main production, scientific and technical, professional and educational potential of the industry is concentrated. In Mykolaiv oblast there is one of the biggest European enterprises of non-ferrous metallurgy – the JSC «Mykolayiv Aluminous Factory», which produces annually more than one million tons of alumina. There are also big enterprises of electroenergy industry, in particular National Energy Generating Company "Energoatom". Implementation of the first phase of CBA Project commenced in Mykolaiv region during October 2008. In July 2011 the second phase of the EU/UNDP CBA Project was launched. During two phases 82717 men, women and children of the region have benefitted from improvement in 63 schools/kindergartens, 7 health posts, 28 water supply, 4 street-lightning, 6 agricultural service cooperatives and so on. This happened through joint effort of the citizens, oblast/rayon/local level governments, CBA Project and the private sponsors. Third phase of the EU/UNDP CBA Project was initiated in Mykolaiv oblast with regional launching and signing of MoU which took place in September, 2014. The oblast received a quota of 9 rayons for standard\replication components. Rayons selected for the the EU/UNDP CBA-III Project: Domanivskiy, Bashtanskiy, Novobuzskiy, Voznesenskiy, Kryvoozerskiy, Ochakivskiy, Veselynskiy, Zhovtnevyy and Snihurivsky rayons. Microprojects approved as of 6 January 2016: 28 micro projects (16 – energy saving, 2 – water supply, 8 – energy efficiency, 2 – business start-ups). Around 20,000 persons will benefit from implementation of these initiatives. Total budget for the initiatives is approx. UAH 9.5 mln (approx. USD 428,000). The EU/UNDP CBA Project will provide around UAH 6.9 mln (approx. USD 311,000). During the Third Phase of the EU/UNDP CBA Project it is also expected to create 4 agricultural service cooperatives in two rayons of Mykolaivska oblast – Bashtansky and Snihurivsky.